Geographical distribution Chirala, Pedana, Polavaram, Mangalagiri, Pochamapali, Ponduru, Dharamvaram, Narayanpet, Puttapaka, Madhavaram, Emmiganur and Gadwal. Indian Weaving Industry has conventionally been one of the most promising sectors of huge employment. 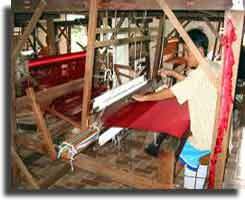 In fact, after agriculture, the Weaving Industry is largest provider of work force. There is abundance in the raw materials; the continuous supply of cheap work force is the contributing factors behind the success of the weaving industry of India. However, the liberalization of the international trade along with change in the reforms of domestic economy, have affected negatively to Indian Weaving Industry. In India the fragments of woven cotton and bone needles have been discovered at Mohenjo-Daro and Harappa, the ancient seats of the Indus Valley Civilization. Even in Rig-Veda and the epics of the Mahabharata and the Ramayana dwell upon the craft of weaving at length. These weavers of the past were true masters of their craft. Their capability was so great that legend even refers to the fabulous semi-transparent sari (worn by Amravati, the famous courtesan). Although the Indian weaving industry employs a large section of the Indian population, it was considered as a failing industry. This ancient industry of India is experiencing a bad phase, a large market for weaving products still exist both in the international and domestic market. The manufacturing of weaving products make the most remarkable contribution to the national GDP and even in the exports revenue. Estimates and analysis over the years have found out that the weaving industry are supporting some 32 other sectors that include marketing, financial, transportation, hotels and even maintenance services. The Indian Weaving Industry has been a self-depending mechanism that includes training the young weavers, abundance of resources and capacities along with helping the industry not to be dependent on the Government. In addition, weaving is eco-friendly, and is aimed at the cutting back on the environmental impact. The weavers' troubles in India began way back in 1995-1998 when the Deve Gowda government imposed a ban on Chinese silk yarn. The basic idea was that Varanasi saris would only be woven from silk yarn from Bangalore. Because of its superior quality, some weavers started smuggling Chinese yarn into the holy town. Realizing that their need for Chinese yarn would only grow, the weavers demanded an open general license. The Indian Weavers are its biggest asset and it is a marvel that an ancient art such as weaving still exist in our country, but the carriers of this tradition are the least respected lot in this nation. Weaving is skill that is done with utter brilliance which is usually passed on from generation to generation. Throughout history there are evidences that show that weavers have always been a victim of a staunch hierarchical system in the country. Being at the bottom of the system they fall prey to the extreme forms of exploitation. Since the time of Kailas, weavers were the poorest of the lot, the British invasion and their policies of free trade further pushed them to the lowest strata of the society (economically). With the independence of India it was expected that the art of weaving would a get a refurbishment and that there would be an elevation in the status of weavers. However our government was not able to meet these expectations. Indian Weaving industry has traditionally been one of India's thriving sectors of mass employment. Abundant raw materials and an unlimited supply of cheap labor have contributed to its success. Due to the international trade liberalization and domestic economic reforms there has been a major impact on the Indian Weaving Industry. Handloom weavers who make traditional items such as saris, dhotis, bed sheets and shawls have been hit the hardest and contribute to the production. Out of the 38 million people employed in the weaving industry 12.4 million, or close to 33%, are concentrated in this declining part of the sector. The majority of them are low caste and extremely poor, working in small family units. More than 40 % of weavers are women. The Banarasi silk saris made in Varanasi are very much famous for centuries for their luxurious, intricately designed cloth. These were a must have for all Indian weddings. More than 600,000 weavers live in Varanasi and nearby districts, weaving mainly for the domestic market. During 1990's, the silk handloom weavers who make the Banarasi saris have seen their fortunes vanish. Trade liberalization is been the driving force of economic globalization, pursued relentlessly by rich nations and international financial institutions at the expense of the poor of the world. Brocade weaving, especially with gold and silver, has been an age-old tradition in India. There are two broad classes of brocades. Brocades of pure silk or silk and cotton blends and zari brocades with gold and silver threads. The most important material in brocade weaving is silk. It facilitates lovely weaves, is durable, strong, fine and smooth. There are several varieties of raw silk of which the chief ones used for brocades are Tanduri, Banaka and Mukta. Tanduri is imported from Malda and other places in Bengal. Banaka is thinner and finer variety and is mostly used to weave soft fabrics such as turbans and handkerchiefs. Mukta is a coarse and durable silk used for kimkhabs, a fine silk would not withstand heavy gold patterns. Over 38,00,000 Indian Weaving industries have been built throughout the country and more than 15, 00,000 domestic weaving industries have been set up in the states of North and Eastern parts of India. In the southern states a huge share of weaving industries, like in Andhra Pradesh houses some 3, 20,000 weaving industries. Most of the Weaving industries are situated in Chirala, Pedana, Polavaram, Mangalagiri, Pochamapali, Ponduru, Dharamvaram, Narayanpet, Puttapaka, Madhavaram, Emmiganur and Gadwal. India had numerous trades with the outside world and Indian textiles were popular in the ancient world. Indian silk was popular in Rome in the early centuries of the Christian era since olden days. The Hoards of fragments of cotton material originating from Gujarat have been found in the Egyptian tombs at Fostat, belonging to 5th century A.D. Cotton textiles were also exported to China during the heydays of the silk route. Silk fabrics from south India were exported to Indonesia during the 13th century it self. India also exported printed cotton fabrics or chintz, to European countries and the Far East before the coming of the Europeans to India. The British East India Company also traded in Indian cotton and silk fabrics, which included the famous Dacca muslins. Muslins from Bengal, Bihar and Odisha were also popular abroad. 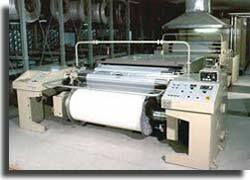 Jai India Weaving Mills Private Limited: Dealing with manufacturing and exporting of weaving products. As per studies, it has been found out that the weaving industry of India provides employment to approximately 12.5 million people, thereby, making this industry the largest provider of rural work force. It is preceded by the agriculture sector. It is estimated that the Indian Weaving Industry would grow by 25% to over 35 million tons by the year 2010. The Indian weaving industry will maintain its growth throughout 2010. Apparel being the mostly used woven products is expected to expand its market in the international arena as well. According to the silk weaving industry a combination of the abolition of quantitative restrictions, declining tariffs on textile imports, and events like the opening of the Nathu La Pass are resulting in cheap imports of silk, especially from China, which is posing serious competition to the Indian silk-weaving industry.